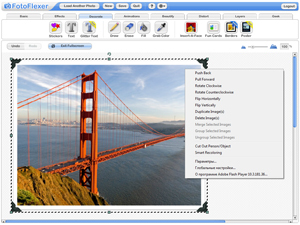 FotoFlexer is a powerful digital photo editor. Many believe that the application is the best or one of the best web-based image editors. It includes a variety of tools and effects from the basics to the professional level, according to the developers, previously only available through expensive software. Users can upload photos from their computers, from PhotoBucket, Facebook, MySpace, Picasa, Flickr, Phanfare, Smugmug, Yahoo Search, or from other Internet resources via a URL. Finished images can be saved on FotoFlexer, sent by email, uploaded to your computer, TinyPic and the already mentioned hosting services. Web developers can use the FotoFlexer API to add image editing capabilities to their own projects. жаль,что не удалось воспользоваться программой.не знаю английского. На англицком загрузил, а на русском ни в какую!? Что-то у меня не хочет он загружать фото. Cергей, там внизу среди прочих языков есть российский флаг с надписью "Russkiy yazyk". Нажимаете - и будет русский язык.